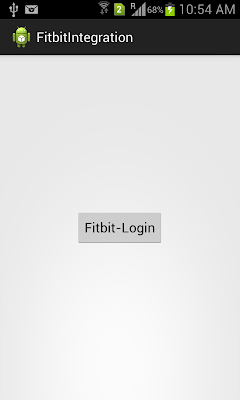 on many demand today i am sharing fitbit account integration in android application. 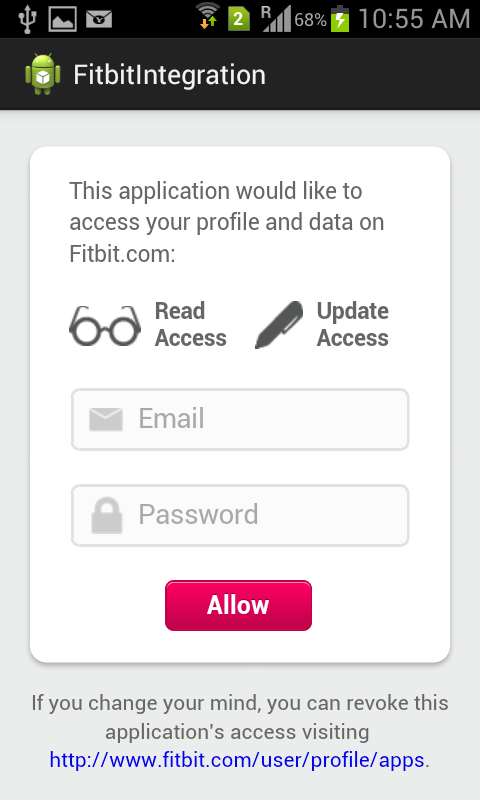 NOTE: please create your application on fitbit and replace with yours credential. Don't use mine in your application. when you follow first step of fitbit developer post, you will get all thing. Just thing you need to do all this steps via code. No dear, i am sorry..
Dear i am android mobile developer and all of my post on android only. So where here desktop and browser? It is working code . Please see screen shot. Mr Manish, first of all thanks for sharing your code. 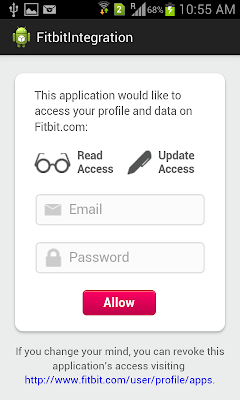 Secondly, I have a quick question: with this code, would I be able to access any information from my Fitbit account? I'm interested in particular information to use in my Android app. Yes of-course, but thing is that check first fitbit APIs whats they provide. Quick question: what are the credentials that I would need to change to make this code work for me? You need to do so many changes in manish's code in order to work it. Fitbit have done many changes after this example. How did you come up with the oauth_token & oauth_signature? Read this https://dev.fitbit.com/apps/oauthtutorialpage. try to achieve this programatically. Hi, one question. In the first fitbit steps to register an app it requires a callback url, so what is that? How can i use if i have to use it? Yes, you can put any may be your company URL or client company URL. it show only for 2 second. right, i'm trying to run your example with my credentials, but where i have to put them? in a url on login method... for callback url what i have to build to have the back responses then? it throws error "No authorization header has been provided in the request". with user_id= null .plz have a look ..
You need to provide header information in request which contains details which you are providing in query string. Read this https://dev.fitbit.com/apps/oauthtutorialpage. You need to provide access token and other details in header in order to use user data. i am getting this error message . Please let me know how can i resolve this error. This page is no longer valid.it looks like you provided an invalid token or someone already used this token you provided.please return to the site or application which sent you to this page and try again. I think you might be getting this error after approve, you are pressing back which is not a valid URL. or you have not provided call back URL. Well, I am not sure either. Please refer to fitbit doc. Diana, it is old code. May be Fitbit make changes in API. Please follow Fitbit developer for updated result.